The Fashion Cult prizes beauty, utility, comfort, and longevity. 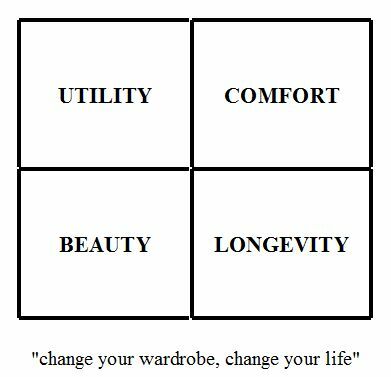 These Four comprise the matrix of true luxury, the pursuit of which is for the greater good. It is recognized that the definitions of The Four are not rigid, but ever-evolving and specific to the location in time and space of a group or individual. The pursuit of beauty and quality (comfort & longevity) is not for the purpose of displaying wealth or communicating status. The pursuit of true luxury fosters greater awareness in consumption, which conserves the resources (including the human variety) of the planet. Everyone, no matter the social or economic status should and can be well-heeled. Where quality is prized as part of the greater good, no cheaply made items – least of all shoes – will be sought by anyone, thereby dissapating the market for them. Let those with eyes for style see these tenets and put them to use without the burden of forcibly converting others. Our way of life is the announcement.